Everybody knows that gaming is big business. Sometimes, though, seeing the numbers all laid out in a row can give a person pause. Gaming really is big business and it’s getting bigger every year. Most encouraging for anyone who likes seeing a robust gaming industry is that it’s also growing. The future of PC gaming, for example, has been questioned given the rise of consoles and mobile, but PCs are doing just fine, thank you. In fact, PC gaming was the No. 2 largest gaming market and it’s growing, according to Superdata Research. 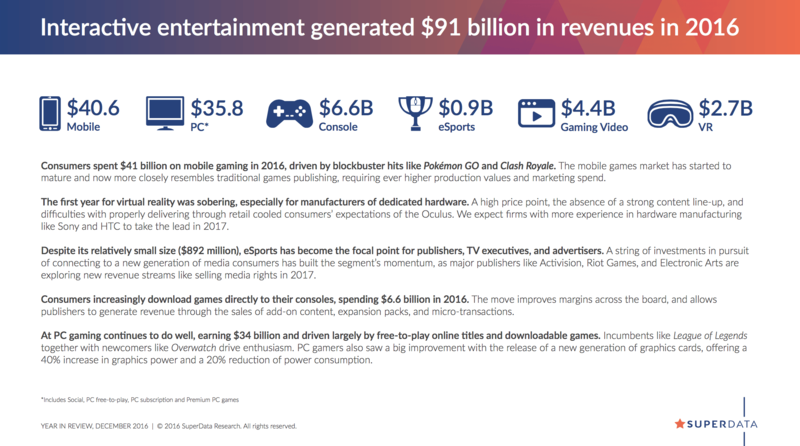 Total spending for interactive entertainment across all devices and platforms was $91 billion, which represented significant growth over 2015. Mobile gaming was the largest market overall, generating $41 billion in revenue with Monster Strike and Clash of Clans leading the way. Pokémon Go was also an incredibly successful mobile title, generating $788 million in revenue. The total PC gaming market was at $34 billion, including both premium and free-to-play gaming. Overwatch generated $586 million in sales, Counter-Strike: Global Offensive was at 257.2 million, and Guild Wars 2 came in third at $91 million. Microsoft’s Minecraft was also a successful title at $89 million. In terms of free-to-play games, League of Legends generated a massive $1.7 billion in revenues, followed by Dungeon Fighter Challenge at $1.1 billion and Crossfire also at $1.1 billion. Console game revenues were strong at $6.6 billion for 2016, up from $5.7 billion in 2015. Call of Duty: Black Ops III was in first place with $592 million in sales, FIFA 16 in second at $387 million, and Grand Theft Auto V came in third with $379 million. 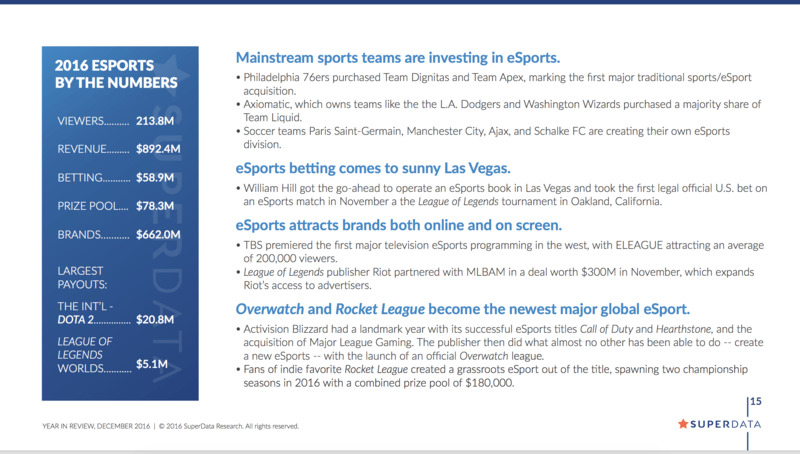 Other markets of note for 2016 included esports, which generated $892 million, a significant increase that’s expected to be even stronger in 2017. Gaming video content such as YouTube Gaming and Twitch also increased significantly, at $4.4 billion in revenue, representing a 35 percent increase over 2015. Virtual reality gaming was at $2.7 billion, held down somewhat by the relatively high price of VR systems. Overall, the gaming market continues to be strong, and should only get stronger with more powerful PC GPUs and next-generation consoles like Microsoft’s Project Scorpio arriving in 2017. Whether you’re a PC, console, or mobile gamer, or just like to watch other people play video games, you’re likely to be spending quite a pretty penny for the privilege.